The Jungle Book is actually a collection of short stories written by an English author Rudyard Kipling. Based on the story Director Jon Favreau decided to direct and co-produce the movie in the year 2013. This film was Walt Disney’s third work and second live action adaption of Rudyard Kipling’s story, the first a 2D animated movie in 1967 and second in 1994 being the same name The Jungle Book. Jon Favreau was encouraged by Walt Disney Studios chair-man Alan Horn to take advantage of the film’s setting and story as an opportunity to use the latest advancements in technologies. 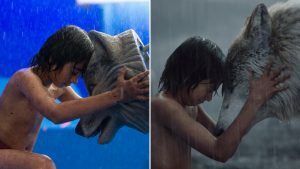 Aside from Mowgli, acted by youngster Neel Sethi, every other character is CGI (Computer Generated Imagery). The most interesting part is that the entire film making was done in Los Angeles. Lots and lots of green and blue screen were used to shot the complete movie. Nearly 70 species of different Indian animals were featured in the film, with several species were showed as 150% larger than its actual size. The cast were announced in March 2014 with Idris Elba to voice Shere-Khan, Bill Murray to Balloo, Scarlett Johansson to Kaa, Ben Kingsley, Chritopher Walken and Lupita Nyong’o to cast as Bagheera, King Louie and Raksha respectively. 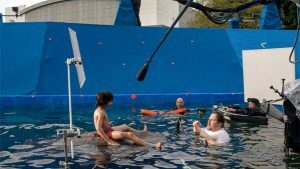 Principal photography took place entirely on sound stages at L.A. Studios in Los Angeles. Moving Picture Company (MPC) and Weta Digital created the film’s visual effects. For animating King Louis sequence, Weta Digital was set responsible. 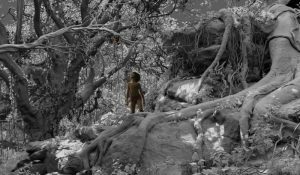 About 1000 remote jungles locations in India were photographed and used as reference for the post-production. Many of our students are working in MPC, Bangalore today who have passed their courses from MAAC Chowringhee, MAAC Kankurgachi and MAAC Rashbehari and are a part of the several award winning movies. They have even worked in The Jungle Book itself.